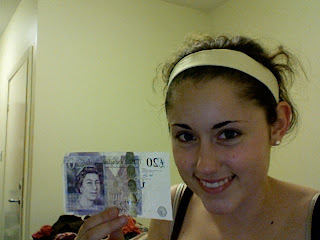 That mug of the queen on my newly converted cash can only mean one thing: Northern Ireland this weekend! Well, okay, I guess it could mean a trip to London, as well, but I'm not going there so work with me. Here's to avoiding any major religious conflict! Although, that would make quite the blog post. When we get back on Sunday, we're all heading over to a Super Bowl party at a pub with the DCU American football team. It doesn't come on until 11 p.m. here, but there's no way we're missing out. We don't have class until 2 p.m. the next day, so we'll all have time to rest. Keep an eye out for the blog post on Monday! "Now statistics prove, prove that you've one birthday. Imagine, just one birthday every year. Ah, but there are 364 unbirthdays. Precisely why we're gathered here to cheer." The Bean Leaves for Madrid!